The Philadelphia Phillies and New York Yankees are moving in the wrong direction following losses in MLB on Tuesday. Philadelphia suffered a pair of defeats against the Washington Nationals in their doubleheader, while the Yankees went down 10-5 to the Minnesota Twins. In New York, the Yankees are not playing badly, they are just not playing well enough to hold off the Oakland Athletics' charge for the number one wildcard spot in the American League. The Yankees' loss to Minnesota on Tuesday dropped New York to 5-5 in their last 10 games, while it allowed Oakland to cut the wildcard lead to just two as the Athletics won 3-2 against the Baltimore Orioles. Oakland have made up two games in the past three days and four in the last eight. 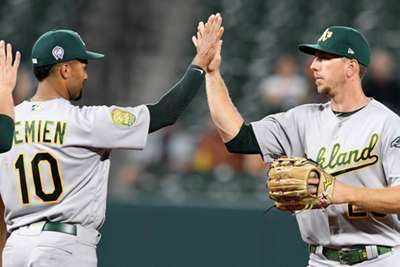 The Athletics are now coming for both the Yankees and the Houston Astros. In Philadelphia, the Phillies are in danger of giving up their spot in the National League East to a Nationals team that surrendered and moved multiple key pieces. With 3-1 and 7-6 losses to Washington, Philadelphia are now six-and-a-half games adrift of the Braves for top spot in the division and just one-and-a-half games ahead of the Nationals. St Louis Cardinals starter Miles Mikolas allowed just one earned run in seven innings while striking out five in an 11-5 win over the Pittsburgh Pirates. St Louis moved to within one-and-a-half games of the top wildcard spot in the NL and opened up the lead on the second spot to three games. New York Mets ace Jacob deGrom set an MLB record by posting his 26th consecutive start allowing three earned runs or fewer on Tuesday. He threw seven innings, allowed just two earned runs and struck out nine. He still took the loss as the Mets fell to the Miami Marlins 5-3. DeGrom has a 1.71 ERA this season but has an 8-9 record. Detroit Tigers outfielder Nick Castellanos went 0 for four with two strikeouts in the team's 5-4 loss to the Astros. Houston remain three games ahead of Oakland for first place in the AL West and moved into second place for the best record in MLB following the Yankees' loss to the Twins. Toronto Blue Jays outfielder Randal Grichuk went 0 for four with three strikeouts in his side's 7-2 defeat to the Boston Red Sox. Boston clinched a playoff spot and moved to within one win of 100 victories. Chicago Cubs shortstop Addison Russell may have had his issues with the bat this season, but he will never lose his ability with the glove. 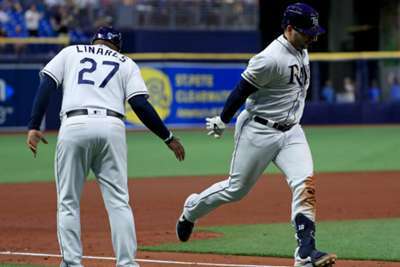 He flashed some leather in the ninth inning of a 3-0 win over the Milwaukee Brewers. With Arizona's win over the Rockies on Tuesday, the Diamondbacks moved to within two-and-a-half games of first place in the NL West, while the Dodgers remain one-and-a-half games back. St Louis still hold a three-game lead on the Dodgers for the second wildcard spot, so these three teams may be fighting for the division or no playoff berth at all. Patrick Corbin (11-5, 3.01 ERA) will toe the rubber for Arizona while Jon Gray (11-7, 4.69) with be on the bump for Colorado on Wednesday.